If you want to teach someone something, the best way is to be there in person. If you can’t be there in person, you can teach them through an article you post on your blog or website. Another way to teach someone is to create a video where you are either standing in front of a video camera and talking to the potential student, or you are doing a screen capture and walking them, step-by-step through the process you are trying to show. Jing, from TechSmith, is Free software for Windows or Mac that helps you create screen capture videos. The always-ready program that allows you to instantly capture images and videos – then share them with anyone. Jing is a great tool for adding basic visual elements to all of your online conversations. Once you install the Jing software on your computer you will see a yellow half circle “sun” appear at the top of your screen. Jing will run continuously in the background, ready to use. Just hover your mouse over this yellow orb to access the options. You can also access Jing by clicking on the yellow icon in the tray area at the bottom right on your Windows computer (the tray is where the time is located). 1. Open the Jing Software using one of the methods above and click Capture. Cross-hairs will appear over your screen. 2. Move your mouse over the area you want to capture as an image or to start a video. 3. Click and drag your mouse over the area you want to capture. 4. When you release your mouse button, hover over the buttons that appear at the bottom of the area. Click the first button to capture the area and then save it as an image. Jing can capture and share videos (up to five minutes long) from your computer screen. Creating a video is an easy way to show someone what you mean instead of typing it in a message or creating a blog post. This is particularly handy if you have a blog or business that requires you to educate your readers or customers on a particular topic. Follow the basic steps above but click the Capture video button instead of the Capture image button to begin your video. If you decide to record a video, you will need to make sure you have a microphone installed and working. 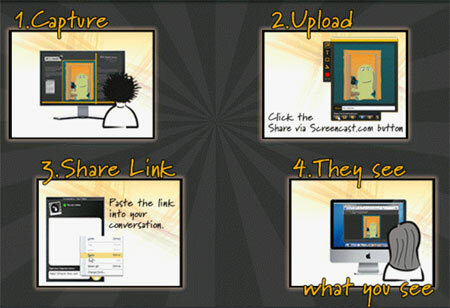 You can narrate your video in addition to capturing the action on the screen. Videos are limited to 5 minutes in length for Jing. You will need the latest version of Adobe Flash Player to preview your video on your computer.